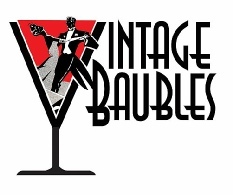 We offer fine, transitional, and quality costume jewelry from the Victorian era through the 80s. Gold, gold filled, sterling, pieces with semi-precious stones, and more. Special-occasion pieces as well as jewelry you can wear to work and for fun! This is just a small sampling of our jewelry inventory; check back soon! Circa 1930s large deco brooch by Little Nemo is perfect as a gift, or for yourself. Anyone who loves red rhinestones will adore this! Set in filigree pot metal with an antiqued silvertone finish, also features 4 enameled flowers in red, pink, seafoam blue-green, and dark lilac. Appears to be a harder-to-find version of another L/N piece that has different enameling on the flowers and enameled leaves at top and bottom, rather than the textured silvertone finish.That version is more casual, we think, while this is a bit more sophisticated. And ours is the only one we currently see online like it. Condition: Metalwork is near mint to mint. Pin stem is straight, clasp works perfectly. Rhinestones are exceptionally fiery, with lots of depth and sparkle; no damage. Minimal wear to edges of some flower petals, a wee bit of enamel loss on the pink flower, as shown--this is magnified several times in the photo, hardly noticeable when viewed at a "normal" distance. Hand-wrought modernist Mexican sterling silver brooch is a great gift for a collector (or for yourself!). 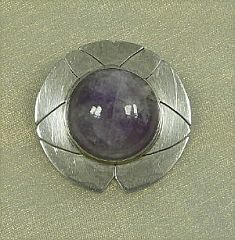 Has a spectacular polished amethyst cabochon “rough”; stone is about 25 mm diameter--much bigger than most you’ll see. Very atomic-looking design lines, which are cut through the piece, not etched. There's a large bail so this can be worn as a pendant as well. Comes with gift box shown. Marked “Hecho en Mexico D F 925”; (made in Mexico City, 925 silver), along with the initials UGO or UGG, which we assume to be the artisan. However, there’s a mystery in dating this, as it has no Eagle assay. Although we’re not experts in Mexican silver, we’ve handled quite a few newer and older sterling pieces, and we’re sure this is NOT post-Eagle era. If anything, it’s pre 1948. Our best guess is early 50s, but somehow got through the system without the assay. There is an artist with the initials "UGG" associated with Mexico City and Eagle Mark 82, but we really think the initials are UGO. Size: Approx. 1 9/16" in diameter at widest. Condition: Excellent. Some typical surface scratching on the metal. These won't be noticeable when piece is worn, but look worse in the photos than they are because of lighting and shadows. Cabochon has natural inclusions, but surface is smooth and not pocked or cracked. 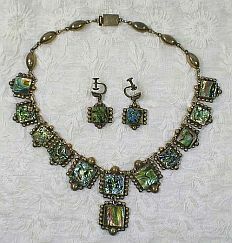 Gorgeous Mexican sterling choker and earring set, ca. 1940s (no Eagle assay, so probably pre-1948). Made of abalone squares set into beaded sterling settings. There are six solid sterling oval beads at the back of the piece. Signed “Hecho en Mexico DF 925” (made in Mexico City, 925 sterling) and has a maker’s mark that appears to be “RRA.” Though we can’t identify this artisan, we have seen a couple other pieces online with this mark, and have seen it referenced on a silver site as a “mystery” mark . Photos simply cannot do this set justice, but please view the entire photo set by clicking the link. Size: Choker measures a hair more than 15” long. The abalone and silver pieces in both the choker and earrings are 13/16″ high x 3/4″ wide. Earring drop from screw back is 15/16″. Condition: Very good to excellent. The abalone insets show no cracks, chips, etc., and the construction and clasp are exceptionally solid. The silver shows some tarnish and the maker’s mark on the earring backs is worn. I’ve polished the silver with only a soft cloth–we don’t use any polishing compounds on our vintage silver pieces, as it can scratch them. This “can” polish up more, but most collectors prefer the slightly aged look that these pieces possess. These ca. early to mid 40s’ Aztec-mask earrings are Mexican silver, artisan made but unsigned. The “faces” have fantastic depth to them (see additional photos) and are a rich jade-green color. We believe the stones to be dyed onyx and not glass, but can’t guarantee that (however, these are so dramatic that we feel it doesn’t make a difference in value). Earrings have screw backs. Marked “Mexico Silver.” Large, bold size to these complements today’s wide bracelets and chunky neckpieces. Size: Measure approx. 1 1/2″ high x 5/8″ wide. Condition: Very good; one earring back has a spot of tarnish or wear that’s darker than “typical.” Due to the handmade nature of these, the settings are not perfect and show some tooling marks. Coro Pegasus double-strand choker in beautiful jewel tones–perfect for any season! Never worn, comes with its original foiled hangtag. 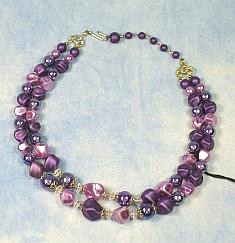 This piece consists of abstract beads in shades of purple and pinky-lavender, plain round faux-pearl beads in the same two colors, and iridescent beads in two sizes. 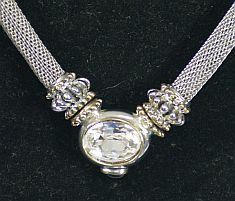 The large beads at the center of the strands feature filigree end caps and AB crystal rondele spacer beads in between. While not 100% certain, I believe the iridescent beads are glass and the other beads, plastic. Size: Approx. 17″ at longest adjustment; shortest bead-only strand is about 12 1/2″, longest about 14″. Condition: New, mint. Any finish flaws are inherent in the manufacturing. These all-rhinestone Weiss earrings, ca. late 50s, are just beautiful. 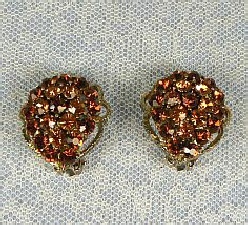 There are 21 stones in each, in two shades (amber and root beer topaz), prong set into a pear-shaped goldtone setting with scalloped and textured edges. Clip backs. The rhinestones are nice solitaire size, about 4 mm each. Size: Measure approx. 1" high x 15/16" wide overall. Condition: Excellent condition, with wear only on the backs. Stones are all bright, clear, and fiery! 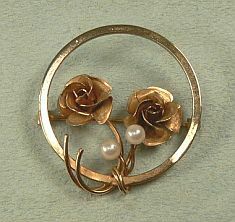 The circle pin or brooch is a classic vintage style, and this example by Turin Inc. is one of the nicest I’ve seen! Double roses on wire-form stems have polished edges on the textured petals, and each is accented by a creamy cultured pearl. Size: Measures approx. 1⅜″ dia. Condition: Excellent, no noticeable wear or flaws. An intriguing, lovely Crown Trifari set in brushed and polished goldtone metal. The brooch looks like a stylized sea anemone or sea plant, with waving, flowing tendrils. Matching earrings are reminiscent of a nautilus shape and continue the curving style of the brooch. Really a striking set, ideal for wear with fall & holiday fashions. Solid pieces with Trifari quality. Carries the Crown Trifari mark with copyright symbol. Brooch measures about 2¼″ high x 1_″ wide; earrings are about 1″ x _″. Excellent condition, almost no signs of wear on any of the pieces. There is one small mark on one of the polished “tendrils.” Since the rest of the piece is in such wonderful shape, this could have been inherent in the manufacturing. Ledo (renamed “Polcini” after the early 1960s) jewelry is harder to find than many brands of costume jewelry, and is of very high quality. These earrings are detailed & realistic, with a striking three-dimensional center floret— a black convex disc with individual black "stems" tipped in gold. Even the backs feature beautifully textured goldtone surfaces. These earrings are little works of art! Condition: Near mint; appear rarely or barely worn. Refreshing choker-style necklace from Coro, ca. 1950s/1960s. 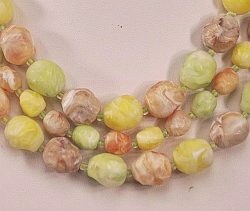 Made of swirled Lucite beads in light grape and pastel citrus shades of orange, yellow, and lime. Small clear glass spacer beads between each bead. Note the beautiful, decorative gold-tone terminal bars depicting small flowers and leaves. 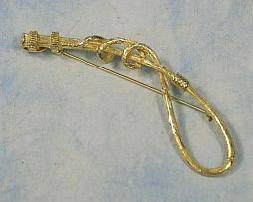 Adjustable hook-and-bead clasp. Size: Shortest strand at shortest adjustment is 15½" long; at longest adjustment, about 18¼". Bead shapes are irregular, but larger beads measure about 14 mm in diameter, smaller ones about 10 mm. Condition: Near mint. Looks unworn. Vintage Avon “Frosted Coolers” bangle bracelet and matching earrings in “Melon,” ca. 1980s. The pink of this is really like the flesh of a watermelon, a cool refreshing look for spring & summer! Matching sets of this jewelry seem to be fairly rare. These pieces feature goldtone insets and a ribbed design. Bangle is nice and wide, right in keeping with today’s styles. 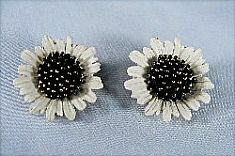 The pierced earrings have post backs with butterfly fasteners. This set is nice enough to give as a gift to a friend who appreciates vintage jewelry or who loves to collect Avon pieces. Excellent, of course, to keep for yourself, too! Size: Bangle measures about 2 7/8″ diameter and about 1 1/4″ wide; earrings are about 1 1/4″ long x 3/4″ across. Condition: All pieces near mint. Les Bernard “pearls” are some of the most realistic-looking ones I’ve ever seen and handled. And this faux pearl and rhinestone neckpiece is stunning! Big and bold, yet feminine, it features large, creamy pearls approximately 11 mm in diameter and several multi-rhinestone balls, each approx. 13 mm in diameter. (Please note I’m not about to place metal calipers on pearls to measure them!) String is hand knotted between each pearl. The clasp is a simple hook and catch, easy to do and undo without assistance. Maker’s mark is on the catch end of the clasp, but very hard to photograph. Les Bernard was founded by Bernard Shapiro, whose father was with Vogue Jewelry, and Lester Joy. It was in business from 1963 until some time in the 90s. Under-appreciated by some, but its quality is widely recognized among vintage jewelry aficionados. Their styles ranged from Art Deco influenced to the oversized looks of the 80s. 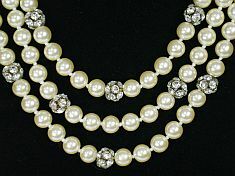 We estimate this necklace to be from the 80s, when the big pearls worn by Barbara Bush came into vogue again. Size: Shortest strand is about 15 1/4" long, including clasp; longest is about 19" . Condition: Near mint. Finish on pearls is in fabulous condition; all I see are the small sorts of imperfections one finds in real pearls (by design, I imagine). Rhinestones are bright and sparkly–no dull, dead, damaged, or missing stones. 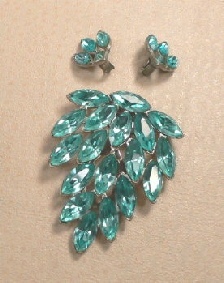 Beautiful matching set of rhinestone dress & earring clips! It’s extremely rare to find a matching set: In Marcia “Sparkles” Brown’s book Unsigned Beauties of Costume Jewelry, she shows only two. This dress clip is nearly identical to the one on the cover of the Antique Trader Jewelry Price Guide, 2nd Ed., 2007. That one is in sapphire-colored stones; this blue is like an aquamarine or blue zircon. Based on the patent number, I date this set ca. 1931 to 1948, most likely the middle part of that period. 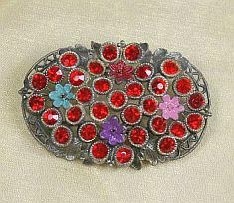 Set in plated (probably rhodium) pot metal, dress clip features 18 large navette rhinestones, each approx. 15 x 8 mm. Size: Dress clip measures approx. 2 11/17" long x 1 7/8" across widest point; ear clips, 3/4" long x 5/8" wide. Condition: Excellent. All stones are clear & brilliant. Backs show a few areas of finish wear. All clip mechanisms are tight, dress clip teeth are perfect. Apparently worn rarely. This fabulous Les Bernard† sterling modernist brooch is rare. I’ve been collecting this maker’s pieces for several years and have never seen one remotely like it. Les Bernard all-sterling pieces are generally small and many have a vermeil finish and diamond-point texture. This one, ca. 1960s, is large, bright and smooth, with big, clear rhinestones. Please view the additional photos to get a sense of how stunning this is, although they can’t do it justice! Piece is signed “Les Bernard Sterling” on cartouche. Size: 2 3/8″ across x 15/16″ top to bottom at widest point. Rhinestones are approx. 7 mm square. Substantial, weighing 20 grams. Condition: Excellent, with some minimal, all-but-invisible surface scratches. Front is bright and tarnish free, back has small amount of tarnish. Pin back with rollover clasp is secure. Open-back stones look flawless. † Les Bernard was founded by Bernard Shapiro, whose father was with Vogue Jewelry, and Lester Joy. It was in business from 1963 until some time in the 90s. Under-appreciated by some, but its quality is widely recognized among vintage jewelry aficionados. The firm designed jewelry for the TV series “Dynasty.” Its styles ranged from Art Deco influenced to the oversized looks of the 80s. Great Les Bernard† designer look! Flexible tubular mesh choker necklace sets off a huge clear crystal stone in a wide bezel setting with black glass cabochon at the bottom. The gold-and-silver tone decorative ends “hide” the clever snap catches on both sides. This closure design allows the pendant portion to be fully detached and the necklace portion to worn as a simple, but elegant, choker (will get photos of that configuration and add them). The faceted foil-backed stone is beautiful, very refractive, so it “catches” and reflects back light in flashes of rainbow colors. I estimate this piece to have been made toward the end of the firm’s existence, possibly in the late 80s into the early 90s. Size: Choker portion, with decorative ends, is 16 1/4″. Pendant setting about 1″ across x 7/8″ high, including cabochon at bottom, but not including the snap ends. Beautifully detailed jockey’s crop brooch by Les Bernard, made of finely textured goldtone metal. This piece is from the “Thorobred Winners T.M.C.” series, which consisted of jewelry inspired by racing accessories and fashions. The coordinating line was created by Les Bernard for the Thoroughbred Merchandising Corporation (about which I can find no information). A high-quality piece, in fabulous condition; original owner said she never used it. The Les Bernard Co. is under-appreciated by some, although one of its founders, Bernard Shapiro, was the son of Vogue Jewelry’s Harold Shapiro. 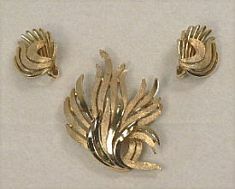 Les Bernard Jewelry was featured on the TV series “Dynasty” and apparently used by designers and worn by celebrities. But its wonderful quality is widely recognized among vintage jewelry aficionados, and it’s becoming more and more collectible. Size: Approx. 3 3/4″ long, 3/4″ wide at widest part of crop loop. Although large, it’s not bulky or heavy and can be worn on a fairly lightweight dress or blouse. Condition: Mint. Any dark areas on photos are shadows and not in the finish. This interesting bracelet from Les Bernard features a braided chain set into an oval hinged bangle. The oval shape fits the contour of the human arm more closely than a round one. I’ve never seen this particular LB piece, and I’ve been collecting it for several years, so I’d say it’s hard to find, possibly rare. 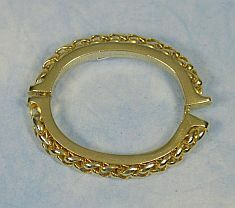 The frame’s smooth, highly polished goldtone exterior has a groove, into which is set a fully round braided-link chain. The frame’s interior has a slight texture. Bracelet fastens with a secure snap closure and safety catch. This is a very solid piece with a quality look and feel to it–when wearing it, you’ll know you have a well-made bracelet on! Size: On the longer side, measures 3 1/4″ outside edge to outside edge, and 2 5/16″ across the inside; shorter side is 2 5/8″ outside edge to outside eges, 1 7/8” across inside dimension. Condition: Near mint, with the most minute signs of wear. 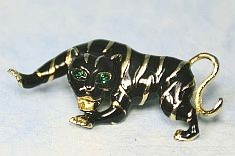 Very dramatic tiger brooch done in goldtone and enameled black finish from Les Bernard, likely from the late 80s or very early 90s. 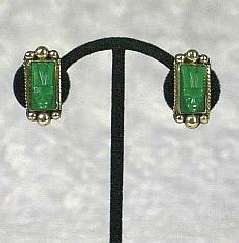 Features glittering faceted emerald glass eyes, and reminds me of the Trifari “Ark” series cats. Nicely detailed; please see additional photos to get a true idea of how stunning this piece is! Size: 2 3/4″ long x 1 1/8″ top to bottom at widest point. Condition: Like new/mint; I see no signs of wear. 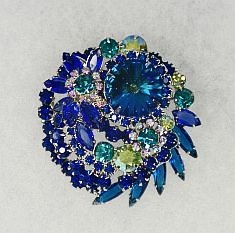 Exquisite verified* all-rhinestone brooch from D & E (DeLizza & Elster, the company that made Juliana jewelry. Many call all D & E jewelry “Juliana,” but the firm made jewelry for decades for many different companies. This brooch features all the classic D & E construction plus comes in a tiered, or layered, design, giving it dimension. Features a huge rivoli stone focal point, which is surrounded by chatons in sapphire and capri blues, clear green and green iridescent chatons, and sapphire-blue, open-back navettes. Two of the green stones are surrounded by tiny pink iridescent stones to create “flowers.” Brooch fastens with hinged pinback and rollover clasp, which is tight and secure. Size: Approx. 2 1/8″ in diameter across widest point. Stands about 5/8″ high at highest point. Condition: Near mint, with ta very slight dulling of the finish on the back (see photos); this looks to me like something inherent in the manufacturing. No signs of wear. Renoir/Matisse designs of the 50s are noted for their modernist style and copper & enamel construction. These clip-back earrings have copper and high-gloss-enamel leaves finished off by a copper partial circle. The enameling is in varied shades of green and yellow gold. 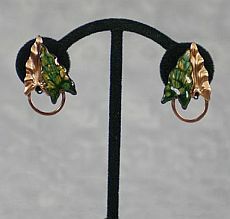 Are larger than many of the leaf-styled earrings from this company. Size: 1 1/4" high, tip to bottom-most part, x 3/4" across widest point. Condition: Excellent, with the most minute tarnish on the backs.